I was called into ministry at the age of 19, while serving at Youth Camp as a Camp Counselor. I attended Southeastern College in Lakeland, FL and received a BA in Pastoral Ministry. After College I returned to Calvary A/G in Mobile and became Youth Pastor. While serving as Youth Pastor, I met and began to date my sweetheart - Beth, who became my wife on October 6, 1984. 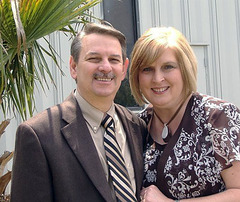 We have served as Youth Pastors in Jackson, AL; Williston, FL; Enterprise, AL and Clanton, AL. We served 10 years as the Senior Pastor of Coleman A/G in Frisco City, AL. After returning to Mobile, I served as a Hospice Chaplain and Associate Pastor at Calvary and became Lead Pastor of Calvary in April 2008. Sister Beth Edwards also serves as our Principal/Administrator of Calvary Christian School and as our Women's Ministries Pastor.